Learn how to become a permanent makeup and microblading artist. Get a thorough understanding of Permanent Makeup with this intensive hands on training program . 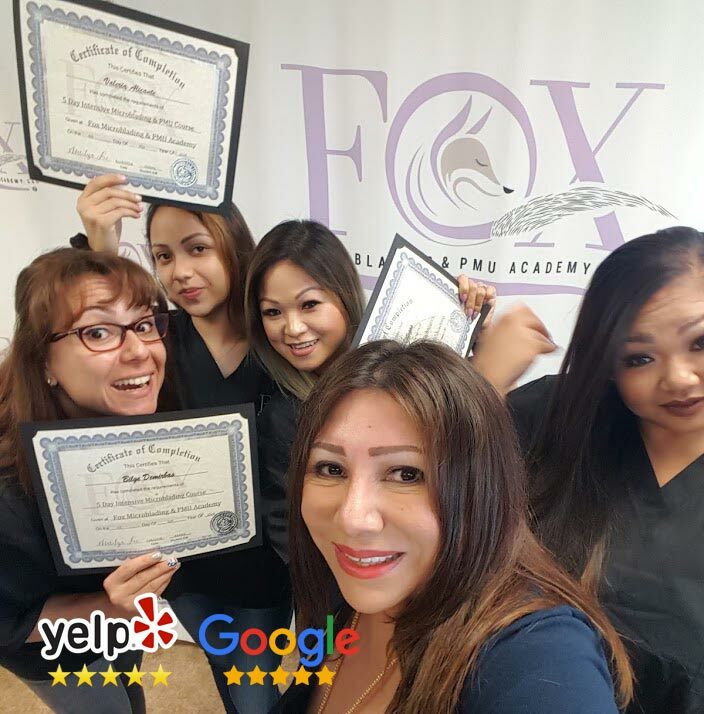 Our top graduates earn over $120,000 per year with a Permanent Makeup and Microblading Certification from Fox. Fox Microblading Academy is conveniently located just 10 minutes off the 405 freeway in beautiful Huntington Beach, California. Our small class sizes and luxurious studio is the perfect place to master the art of Permanent Makeup. We limit our classes to 4 students so that you can enjoy distraction free learning. Our curriculum is packed with knowledge and goes in depth into topics such as color theory, sterilization, and eyebrow shaping. No Hidden Fees or Additional Items to Purchase! Our prices include everything you need to complete the permanent makeup certification course. We include tools, supplies and pigments needed for you to work on about 20 clients or models. We include the PMU machine and microblading hand tools for every student. We consistently earn 5 star reviews on Yelp, Google, and Facebook. That’s because we go above and beyond what you would normally expect from a Microblading & PMU Academy. Read reviews from students and models to see why we’re the best Permanent Makeup and Microblading Academy in the Greater Los Angeles Area. Lock in your early registration price with a $500 deposit. Students who register 2 months in advance can save up to $500 of registration fees. Seating is limited so register as soon as possible. Don’t let your future pass you by.